Albany Avenue is not necessarily known for its fine dining restaurants. It is mostly strip mall type places, fast food joints and a few restaurants sprinkled here and there. 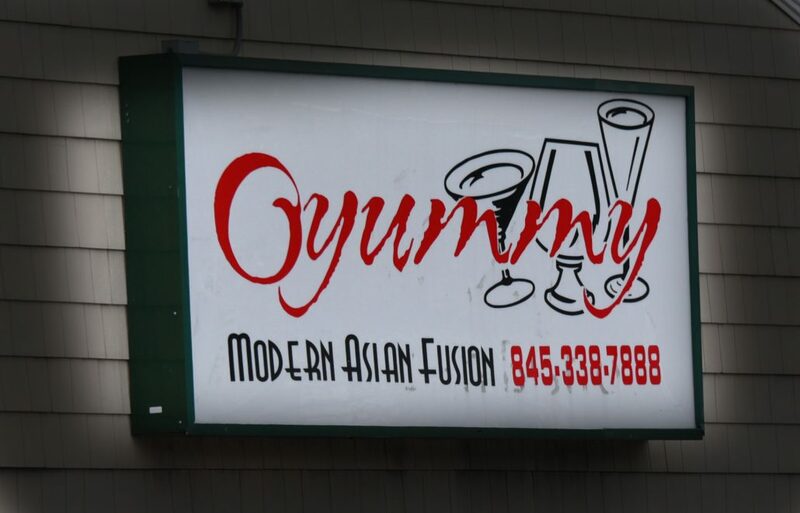 If you did not know it was there, you would drive right by Oyummy without a second thought. What a shame, because this is one of the best Japanese restaurants in Kingston. Going back probably ten years, it was an Italian deli, Bruno’s, which was fantastic. 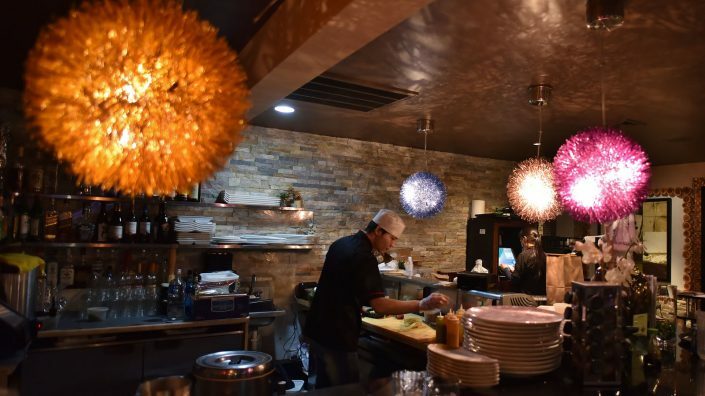 Fast forward five years and it was transformed into Kodomo, a Japanese restaurant with a sister establishment in the Marshall’s Plaza. 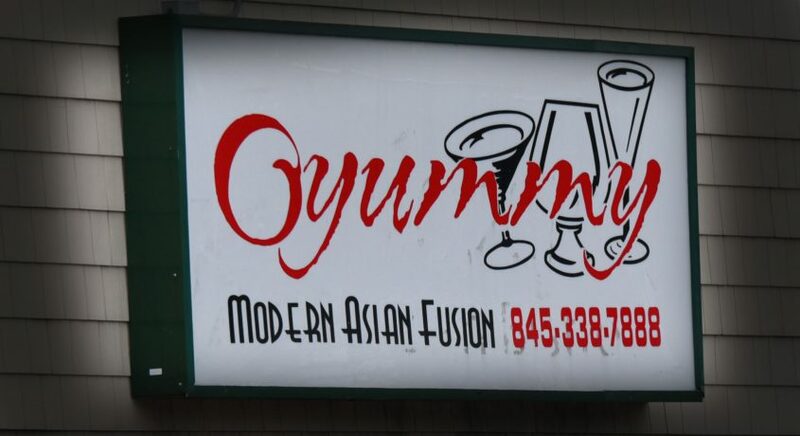 After several years of sibling rivalry, the place was given its own identity and re-christened Oyummy with a slightly different, more adventurous menu. 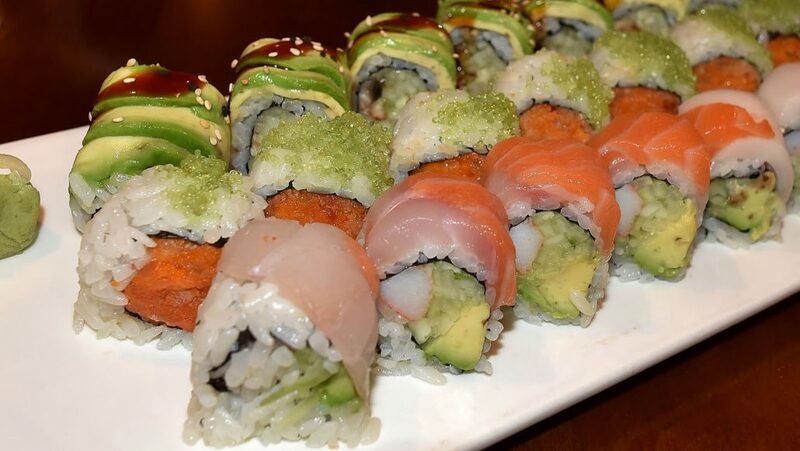 Personally, I could eat sushi every night of the week. When Companion One suggested Oyummy, I was up for the task. Companion Two does not care for sushi in the winter, preferring to consume raw fish in the heat of the summer. After a little prodding, I got Two to agree after reminding him of the many times I’ve conceded to his dining whims. Visually, this tiny Japanese restaurant is a delight. From the de-constructed, re-constructed birch tree in the center of the room to the rattan wall room divider, a suggestion of shoji screens, there is an attempt to convey a feeling of a traditional Japanese country inn. The banquettes are a coppery bronze embossed with Asian lettering. The hanging lamps look like sea urchins that shine in patterns on the ceiling. The different textures and colors have the effect of many different rooms in one open space. With earth-tone colors and subdued lighting, it is not a unified theme, but it feels like it all comes together. 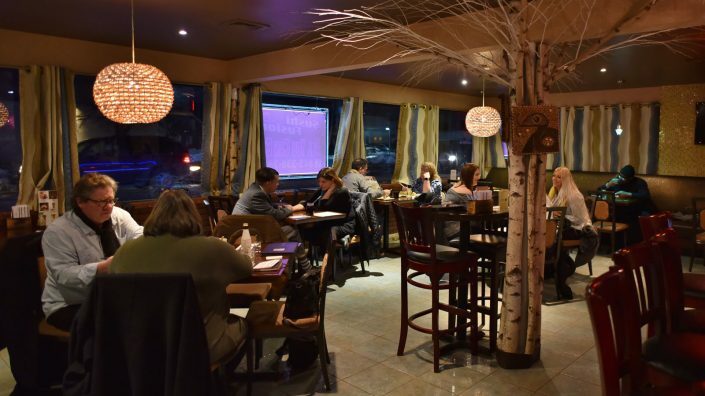 Stepping into this restaurant, takes you miles away from where it resides on a four-lane commercial strip of roadway. We were in luck that Friday night, when we discovered the Kitchen/Sushi Bar menu, all you can eat for $23. Companion One opted for that menu, while Two and I decided to order from the regular menu. Technically, you are not supposed to share or they will charge you full price for that item (as well as any item that you want to take home with you). However, since we were reviewing the restaurant, the staff conveniently looked the other way. 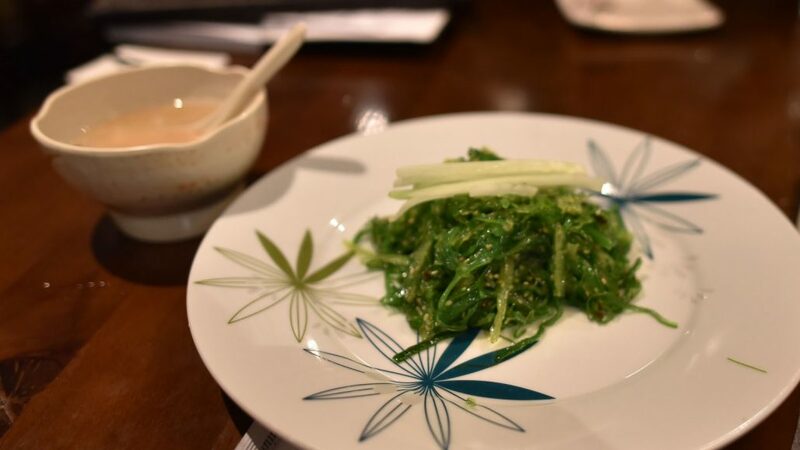 C1 ordered the chewy, sesame-dotted seaweed salad, clean and tasty with a hint of sesame and the crispness of cucumber. This was followed by a bowl of Miso Soup and the cutest little Spring Roll I ever saw, devoid of grease and full of crunch. His Salmon Teriakyi was lightly seared and not overly sauced. 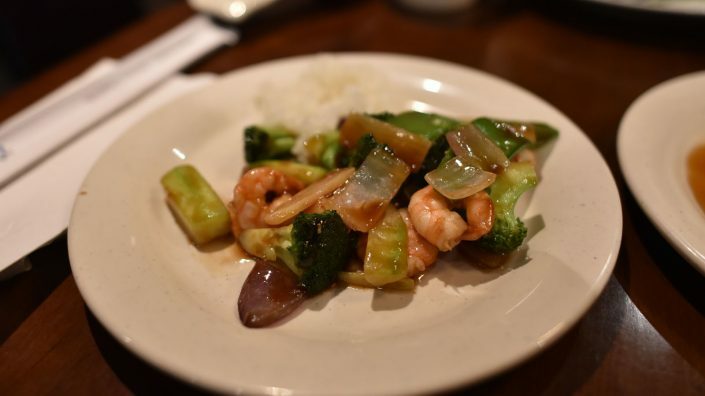 Dotted with small pieces of broccoli, the Shrimp Vegetable was finished with a smoky sauce. The All You Can Eat Menu is a fabulous bargain, where a sushi hound such as myself just might tend to overeat a little. Knowing my propensity toward raw fish, C1 recommended we order from the menu. We started with the Tom Yum Soup ($4) and the Dumpling Soup ($3). 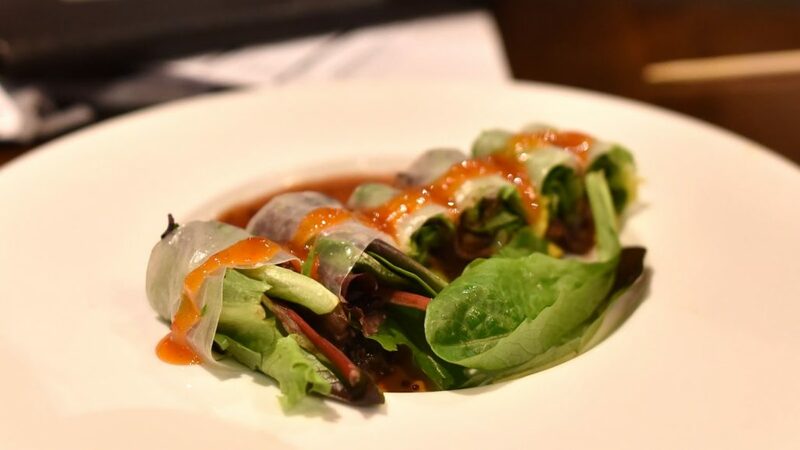 The Tom Yum is hot and sour prawn seasoned with lemongrass; and the Dumpling showcases filling encased with dough so thin you can almost see through it, then crisped to perfection to swim in a rich broth tasting somewhat redolent of parmesan cheese. 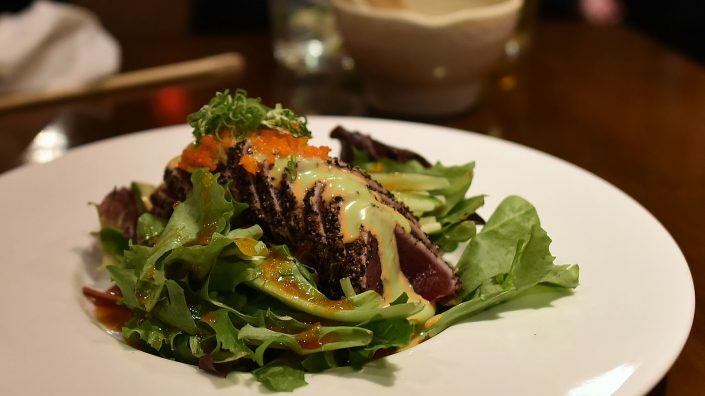 Our Peppered Tuna Salad ($8) was served on mixed greens with avocado and a yuzu wasabi dressing. The slices of tuna, marinated, were seared at the edges and sushi-raw inside. It had a nice heat garnished with tobiko and that delicious dressing. For an entree C1 and I ordered a variety of rolls (all $9): The 3 in 1 Spice Roll is a spicy tuna, salmon and white tuna with wasabi and tobiko; Wrapped in avocado, the creamy, melt in your mouth Dragon Roll stars eel and cucumber; and the over-the-top Rainbow Roll with crabmeat and avocado topped with fluke, salmon and red snapper. 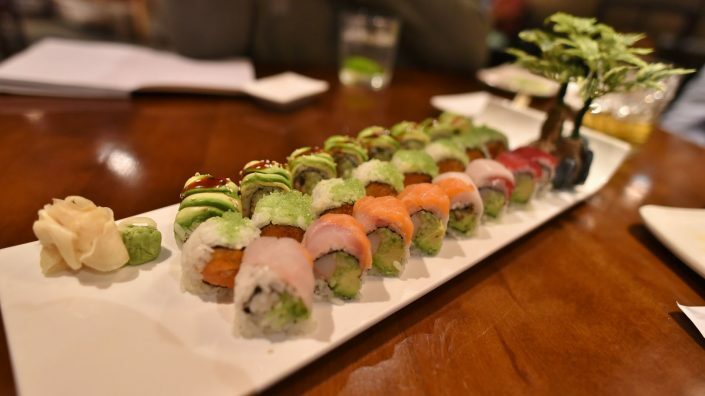 These three rolls were presented on one huge plate that was artfully displayed. I encourage you to eat slowly, drink it all in, appreciate what the chef has done visually for every single plate. They have a full bar, and drinks are reasonably priced with quite a few sakes from which to choose. 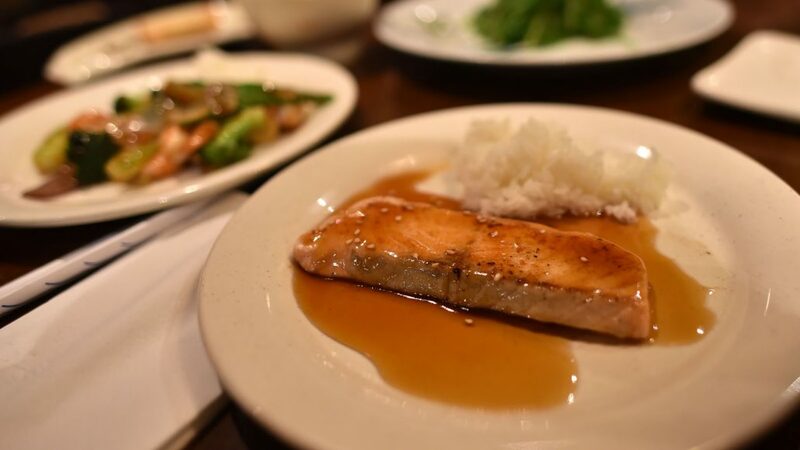 While they don’t have hibachi tables like their sister restaurant, they feature a number of “Casseroles” where you pick a sauce and pick your protein, items from the “Wok and Grill”, “Noodles and Rice” and “Kitchen Signatures” with prices ranging from $8 to $22. And since C1 had the All You Can Eat, we all got a bite of Fried Banana for dessert. How can you go wrong with sweet and deep-fried? 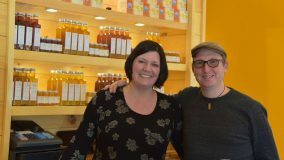 Doers and Dreamers – Corinna and Jason Geib Doers and Dreamers – John Durcan Jr.